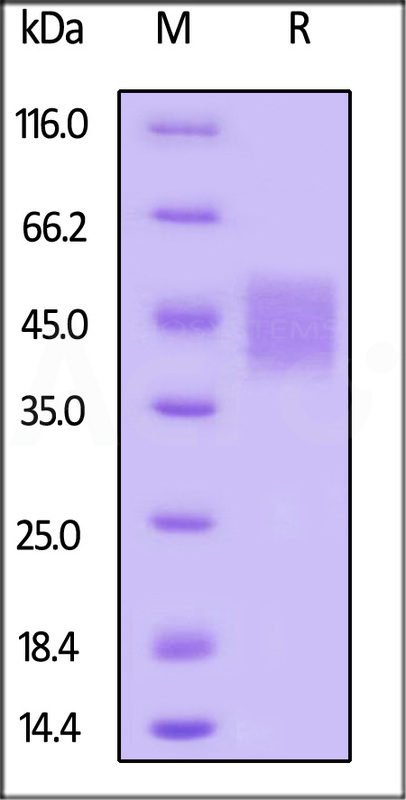 Biotinylated Human SLAMF7, His Tag (SL7-H82E0) is expressed from human 293 cells (HEK293). It contains AA Ser 23 - Met 226 (Accession # Q9NQ25-1 ). The protein has a calculated MW of 25.6 kDa. The protein migrates as 40-55 kDa under reducing (R) condition (SDS-PAGE) due to glycosylation. >95% as determined by reduced SDS-PAGE. Biotinylated Human SLAMF7, His Tag on SDS-PAGE under reducing (R) condition. The gel was stained overnight with Coomassie Blue. The purity of the protein is greater than 95%. SLAM family member 7 (SLAMF7) is also known as CD2-like receptor-activating cytotoxic cells (CRACC), Membrane protein FOAP-12, CD antigen CD319, Novel Ly9, Protein 19A, which is a single-pass type I membrane protein and a member of the CD2 family of cell surface receptors. SLAMF7 is expressed in spleen, lymph node, peripheral blood leukocytes, bone marrow, small intestine, stomach, appendix, lung and trachea. Isoform 1 of SLAMF7 mediates NK cell activation through a SH2D1A-independent extracellular signal-regulated ERK-mediated pathway. May play a role in lymphocyte adhesion. Isoform 3 of SLAMF7 does not mediate any NK cell activation. (1) Bouchon A., et al., 2001, J. Immunol. 167:5517-5521. (2) Murphy J.J., et al., 2002, Biochem. J. 361:431-436.